The top economic priority of BC’s provincial government is to launch a new liquefied natural gas (LNG) industry. This would require doubling to tripling natural gas production in BC’s Northeast, building pipelines to the coast, and building new terminals to super-cool gas to liquid form before shipping to Asia. Sourcing natural gas through hydraulic fracturing (or “fracking”) as an extraction method has become controversial around the world. Concerns include small earthquakes, water contamination, air pollution and the contribution of emissions to climate change. Some jurisdictions have banned the practice; others are seeking to realize economic benefits in the form of jobs and government revenues. 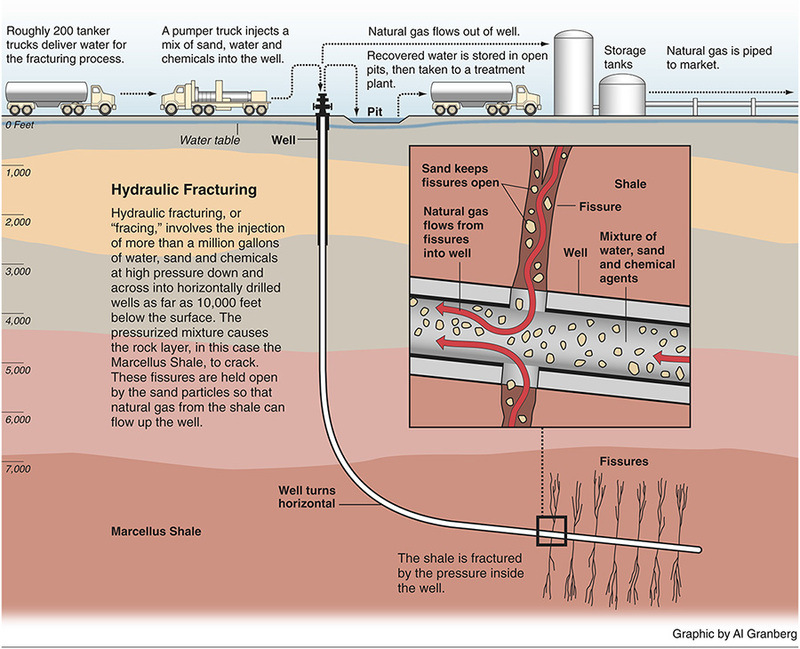 Students will understand the basic processes and issues associated with fracking. Students will understand the connections between fracking and proposed LNG development. Students will identify and reflect on the various stakeholders involved in fracking operations in BC and their respective viewpoints. Students will consider whether or not they would vote to approve a fracking operation in their community. READ ALOUD: Over the next few classes, we will explore the issues and debates around hydraulic fracturing (or “fracking”). In BC, most of the natural gas we produce involves fracking, and there are proposals to double or triple natural gas production for export to Asia as liquefied natural gas (LNG). The government and related industries see this as a huge economic opportunity; others are concerned that lofty economic promises may not materialize, and that key environmental issues are being ignored. QUESTION: What do you know, or what have you heard, about fracking? SHOW VIDEO: Fracking Explained: Opportunity or Danger? SHOW POWERPOINT SLIDE: “Fracking process” in the Fracking: The BC context PowerPoint. BRAINSTORM AS A CLASS: Knowing that natural gas production in BC involves fracking, why might increasing production be contentious? Fracking produces greenhouse gases, including methane, which contribute to global climate change. Fracking requires huge amounts of water resources. First Nations treaties in BC are unresolved, and they have claims and rights to much of the land where fracking operations occur. Some argue that natural gas production is a route towards more jobs and economic development, while others argue that the money spent on a green economy could create more long-term jobs. Natural gas production employs about 4,000 British Columbians. British Columbians subsidize fracking through tax dollars: public roads, corporate tax breaks, and cheap water and electricity all underwrite resource extraction. Only about 15% of the gas produced in BC is consumed here. The rest is transported to the United States and Alberta (to help power tar sands extraction). Surveyors have discovered shale rock deposits and natural gas near the fictional town of Mountainhead, a small community in northern BC. The natural gas company FrackCo has put in an application to the BC government to begin fracking in the area. FrackCo is also seeking additional assistance and resources for the project, such as electricity, access to local water sources and new roads. The company is promising local jobs, payment of local taxes, and funding for various local amenities, such as a new community centre. The project has met with resistance from some groups and support from others. Some people are undecided as to whether they support the project. The town has hired a moderator to run a Town Hall meeting and encourage dialogue with all of the different groups. Fracking in BC is a multifaceted issue with many different perspectives. Over the next few days, we will take on the roles of different groups with different perspectives, and reflect on how we feel about the issues. After all is said and done, we will hopefully be able to answer the question: would we support a natural gas fracking project in our community? How does this role or perspective resonate or not resonate with my own values? Do the goals of this group fit with the kind of world I want to live in? While local benefits and costs are central to the discussion of fracking and fossil fuel development in BC, we also need to consider this topic within the context of human-made climate change, something that affects the lives and livelihoods of people both locally and around the world. 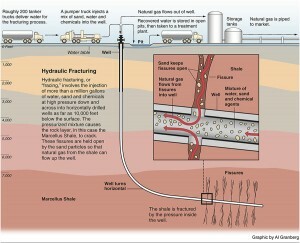 Also, the issue of fracking is closely intertwined with the issue of liquefied natural gas (LNG). The provincial government wants to build new LNG plants on the coast, which will turn natural gas into liquid form to ship to Asia. But the gas to be liquefied comes mostly from northeastern BC, and almost all of that gas is now extracted using the fracking process. Note to teachers: Please ensure that students understand the sensitivity and respect required when representing a cultural identity that is not their own. While the dramatic potential of this activity is part of its appeal, care should be taken to ensure students focus on respectful sharing of researched opinions, and do not “perform” their personas (e.g. by using accents, wearing costumes, acting out stereotypes). In groups of four, students will take on one of these stakeholder personas. All members of the group will be responsible for answering a series of questions and doing research together for the Town Hall simulation. Two students from each group will represent their group in the Town Hall simulation. Other group members will act as observers, taking notes on how they personally respond to the issues that arise, and giving feedback after the activity. Below are some possible suggestions for what each stakeholder group might focus on (separated out in the module PDF for your photocopying convenience). This is by no means meant to be an answer key to the questions above, as how a person might respond is far more complicated and nuanced than what is suggested, but it can be used as a resource. 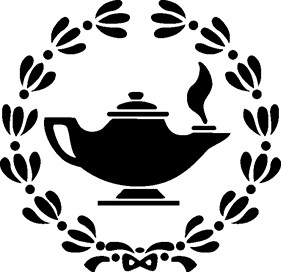 It is highly recommended that students use the internet to seek out information and to guide group discussions to determine what they think their characters might say. Tell us briefly why you do or do not support this project. What is your perspective on the environmental risks and concerns that come with the project? Be sure to consider both local and global environmental issues. What are your thoughts on the best way to ensure the economic health and viability of BC and/or your community? How can local jobs be supported and encouraged? What is your response to the concerns about the impact of fracking on the health of people in the surrounding community? Gas company representatives have a vested interest (making a profitable investment) in having the project go forward. They are ultimately accountable to their shareholders, not people in local communities. Although they acknowledge that there are some environmental and health risks associated with fracking, they want to minimize any additional costs and taxes that might be imposed on them. But they must address local concerns if the project is to proceed. The BC government supports the fracking project in Mountainhead. Their main focus is on economic growth for the province and they feel that fracking and LNG have the potential to bring a massive amount of money to the BC economy. They are somewhat concerned with the environmental and health issues raised, but feel that the established procedures and regulations are enough to ensure safety. However, they do care about public opinion on the matter and won’t move ahead without popular public support. Resource workers (both local and within the province) hoping to gain employment on the project acknowledge that there are concerns about fracking, but generally support the project because they believe it will bring jobs to the community and will boost the local economy. They are concerned about the environmental and health risks, as well as safety issues at fracking worksites, and want all of these issues addressed if the project is going to move forward. At the end of the day, they would support any initiative that brings the most jobs and long-term economic security to themselves and their families. Members of the First Nations communities in the area are open-minded about new economic development possibilities, but generally do not support the fracking project. They are very concerned about the health and environmental impacts, particularly with regard to water contamination. They are also concerned that their way of life (which includes hunting and fishing) and the potential for economic development in local eco-tourism could be compromised. They want to ensure that any profits or opportunities for local development are shared with local First Nations communities. Legally, they must be consulted and give consent before any fracking operations take place on their land because of unresolved land treaties. Other community members who live in Mountainhead are undecided about whether they support the project or not. They are concerned about risks to their water supplies, health impacts for their families, and impacts on local industries, like farming and eco-tourism. But they are attracted to the idea of new economic development and high-paying jobs. Some are worried that the jobs brought to town might only be for the short term. They are also concerned about the effect a fracking worksite might have on their community. Environmental advocates from across the province are opposed to the project. They are very concerned about the health and environmental risks, specifically how fracking contributes to climate change, contaminates water supplies and causes other pollution. They argue that BC can create more well-paying, long-term jobs by investing in a green economy instead of fossil fuels. Be sure to give groups enough time to answer the questions above, and to develop their understanding of their personas and the issues, in preparation for the Town Hall meeting simulation. Two representatives from each group sit together in the middle of the room, preferably in a circle. Observers (those not actively speaking for the group) sit surrounding the stakeholders. They are responsible for taking rough notes of their observations during the simulation. Read aloud the Scenario and Context sections from Part 2. At your discretion, choose questions to ask the stakeholders, allowing two minutes for each group to respond. How was this Town Hall like real life? How was it not? For the two active speakers from each group (non-observers), how did you feel acting in your role? For observers, which group(s) did you most strongly resonate with? Why? Did your opinions change over the course of the Town Hall? Why or why not? Who stands to benefit if the fracking proposal is accepted? Who is unlikely to benefit, and what are some of the potential losses they may face? Does the fracking proposal promote fairness and justice in BC? Why or why not? What effects could a fracking project have on global climate change and local climate justice? Would you support a fracking project in your community? How does your group’s role or perspective resonate with your own values? How does what your character was advocating for fit in with the kind of world you personally want to live in? How does climate justice fit into the discussion about fracking and LNG in BC? Will LNG development blow BC’s carbon budget?